Last weekend, twelve people (including six Marin residents) attended a training to become League-certified Cycling Instructor. 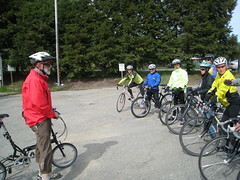 Jim Baross, a trainer with the League of American Bicyclists (LAB), led participants in a rigorous weekend-long training course to teach participants how to teach bicycle skills and safety practices. All participants passed the course, and are now certified instructors in the LAB's smart cycling program, which is designed to teach adults and children to confidently ride bicycles in a variety of road and traffic scenarios. Participants reported that the class was a resounding success, and created a skilled, enthusiastic group of educators to increase bicycle safety in the Marin County. The course was subsidized for Marin participants by WalkBikeMarin for Marin residents as part of the Nonmotorized Transportation Pilot Program's bicycle education efforts in the county. Update 4-9-09: A complete list of Marin-area League-Certified Instructors has been posted [PDF]. They can be contacted to set up training classes for adults and children. Congratulations to the new instructors!